German Chancellor Angela Merkel has to face down some unrest within her own party while also embarking on difficult coalition talks. Meanwhile, her French counterpart Emmanuel Macron is making a powerful case for a fundamental reform of the European Union. Chances are he will get her support. Emmanuel Macron is stepping on the gas. On September 22, the French president signed a far-reaching labor market reform into law; on September 27, his government presented its first budget, detailing some sharp cuts to expenditures as well as tax relief. In between, he also agreed on a merger between the rail businesses of France’s Alstom and Germany’s Siemens, as well as an Italian takeover of the French naval shipyard STX. All this made a perfect backdrop for Macron’s speech at the venerable Sorbonne University that same week: For one hundred minutes, he outlined the most ambitious French reform proposal for the European Union since Robert Schuman’s plan for a coal and steel community in 1950. The president’s message was clear: France is doing its homework in terms of domestic reforms and cuts, and refocusing its industrial policy – unimaginable until now – to create European champions rather than protect French corporations. Now is the time to take the next step: get Germany on board for a serious overhaul and modernization of the EU and the eurozone. “The only path that can safeguard our future is the re-founding of a sovereign, united, and democratic Europe,” the French president said. “The Europe we know today is too weak, too slow, too inefficient, but it is also only Europe that can give us the capability of action in the world, facing today’s great challenges.” Macron’s plans include common institutions for defense, external border control, and asylum policy as well as tax harmonization and a eurozone finance minister with a dedicated budget. Yet for all the president’s enthusiasm, the reaction from across the Rhine was muted. Macron had informed Chancellor Angela Merkel about his proposals in advance, yet she took a full two days before reacting publicly. There is “a high degree of accordance,” she said after meeting with Macron in the Estonian capital of Tallinn. The French ideas on defense and migration in particular were extremely positive Merkel added, without further commitment. Of course, the chancellor is just recovering from an exhausting election campaign in which Europe was hardly ever mentioned. In contrast to Macron, who won the French presidency in May on the explicit promise to fight for European integration, Merkel has no mandate from her voters to engage in any kind of fundamental reform. Nor did the German elections on September 24 go particularly well for her: while Merkel is assured a fourth term as chancellor, her party sustained heavy losses, and coalition talks promise to be difficult. Also, with the far-right populist Alternative for Germany (AfD) in the Bundestag for the first time, some of Merkel’s allies are moving to the right. Deeper European integration does not sit well with them. In particular, they reject any additional transfers to poorer countries in the eurozone. 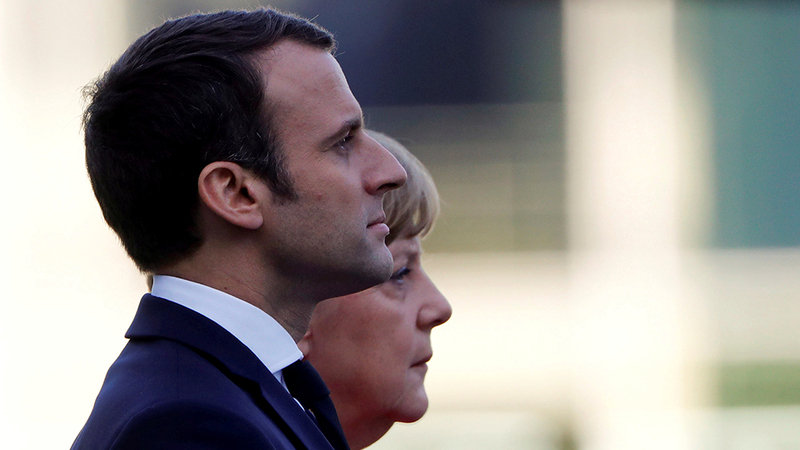 Hans Michelbach from Merkel’s Bavarian sister party, the Christian Social Union, was one of the few politicians in Berlin to react publicly to Macron’s speech, calling the French ideas unsuitable. “They do not lead to a deepening (of the EU) but to a deeper split in the EU,” he said. Merkel’s favorite option was to continue her grand coalition with the pro-European Social Democrats, but she hasn’t yet found any takers: the SPD, after registering its worst-ever election result, is hoping for renewal in opposition. The most likely scenario now is a “Jamaica” coalition (named after the colors of the island’s black, green, and yellow flag) between Merkel’s conservatives, the Greens, and the liberal Free Democrats. In such a coalition, the Greens could plausibly claim the foreign ministry, while the liberals would aim for the finance ministry vacated by Wolfgang Schäuble, who will become speaker of the Bundestag. But while the Greens are enthusiastic about an EU reform à la Macron, the liberals fear that Germany will end up being made to pay for other countries’ spending habits. Macron timed his speech, he explained at the Sorbonne, to come after the German elections, but before coalition negotiations. He knows that once the parties have agreed on the outline of the next government’s program, they won’t easily take on new ideas. Yet with European parliament elections due in 2019, any kind of EU reform will have to be pushed through quickly. And Merkel, for all the difficulties she now faces domestically, knows that the EU must be reformed. This is necessary to stop it from further eroding in the case of another financial crisis or another influx of refugees. Also, it needs to be in shape to weather Brexit. At the same time, the chancellor knows that it is in Germany’s interest to strengthen Macron vis-à-vis his own right-wing populists in the Front National. Merkel may even end up surprising Europe with some ambition of her own. This is, after all, her last term in office, which will give her more freedom to act. With her enormous experience in gaining and wielding power, do not expect her to be a lame duck just yet. Macron, at least, doesn’t think so. At the end of his Sorbonne speech, he very warmly invited the German chancellor to come to France in order to set out her vision of Europe’s future.